Just the other night I heard the author of Stoned, Aja Raden, retell the tale of the Affair of the Necklace of Marie Antoinette. 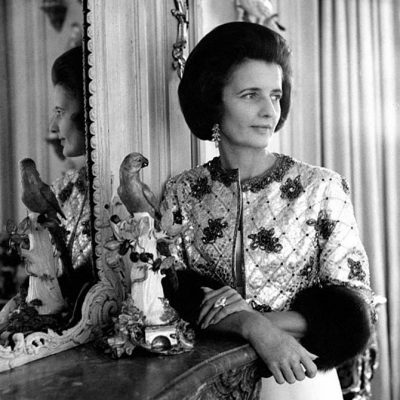 The story is one of the most intriguing in jewelry history. Everyone, including Napoleon Bonaparte, believed it was one of the causes that ignited the French Revolution. In and of itself, the jewel wasn’t the problem. The problem was actually the rumor that Marie Antoinette bought it and defrauded the jewelers. She didn’t, but people believed she did and that was enough. The truth is Marie Antoinette may have been extravagant, but her taste was more refined than the over-the-top necklace that was in fact made for King Louis XV’s infamous mistress Madame du Barry. Since the aforementioned Revolution and the end of Marie Antoinette, there has not been much sign of the jewels she actually did own. 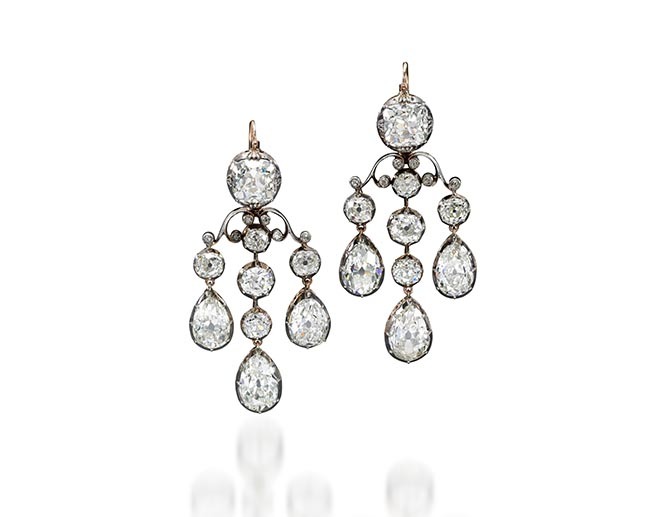 There are a pair of earrings at the Smithsonian that are believed to have diamonds from her collection. A diamond necklace from Antoinette’s collection appeared at Christie’s in 1971 and hasn’t been seen since. Perhaps the most impressive Marie Antoinette jewel to turn up in public was a blue heart-shape diamond ring sold at the auction house in the early 1980s. In March 1791, King Louis XVI, Marie Antoinette and their children began to prepare their escape from France. According to accounts written by Marie Antoinette’s lady in waiting, Madame Campan, the queen spent an entire evening in the Tuileries Palace wrapping all of her diamonds, rubies and pearls in cotton and placing them in a wooden chest. In the following days, the jewels were sent to Brussels, which was under the rule of the queen’s sister, Archduchess Marie-Christine and which was home to Count Mercy Argentau. The count, the former Austrian Ambassador to Paris, was one of the only men who had retained the queen’s trust. It was he who took delivery of the jewels and sent them on to Vienna, into the safe keeping of the Austrian Emperor, Marie Antoinette’s nephew. In 1792, the royal family was imprisoned in the Temple tower. Louis XVI and Marie-Antoinette were executed by guillotine in 1793 and their 10-year old son, Louis XVII, died in captivity. The king and queen’s only surviving child, Marie-Thérèse de France, “Madame Royale”, was released in December 1795, after three years of solitary confinement. After learning of the deaths of her mother and brother, she was sent to Austria. Upon her arrival in Vienna in 1796, she was given her mother’s jewels by her cousin, the emperor. Having borne no children of her own, Madame Royale bequeathed part of her jewelry collection to her niece and adopted daughter, Louise of France, Duchess of Parma and grand-daughter of Charles X, King of France, who in turn left them to her son, Robert I, the last ruling Duke of Parma. 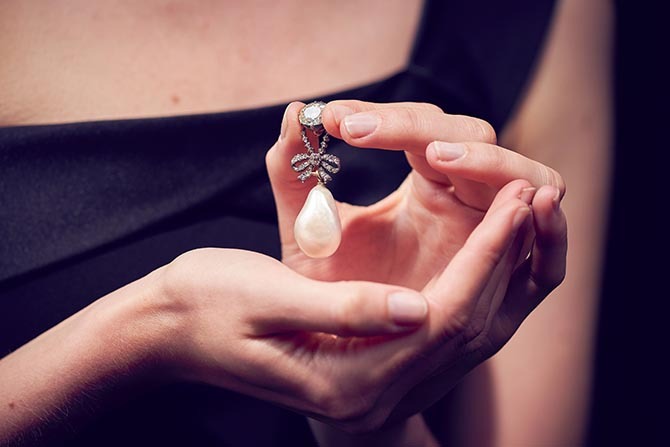 Some jewels in the Sotheby’s collection can be traced through Marie Antoinette’s descendants. See highlights and description of the pieces below. Select items from the collection will go on view in Milan in June, followed by Munich and Cologne in September. There will be an international tour of the sale to London, New York, Hong Kong and Geneva in the autumn. Another view of Marie Antoinette’e pearl and diamond bow brooch gives a sense of scale. 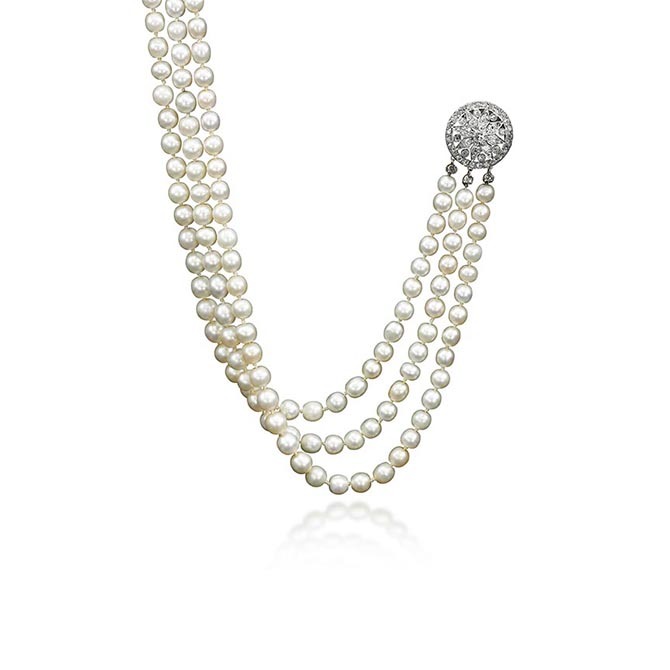 The exceptionally large pearl drop measures 26 mm x 18 mm. Sotheby’s estimate for the jewel is $1-$2 million. 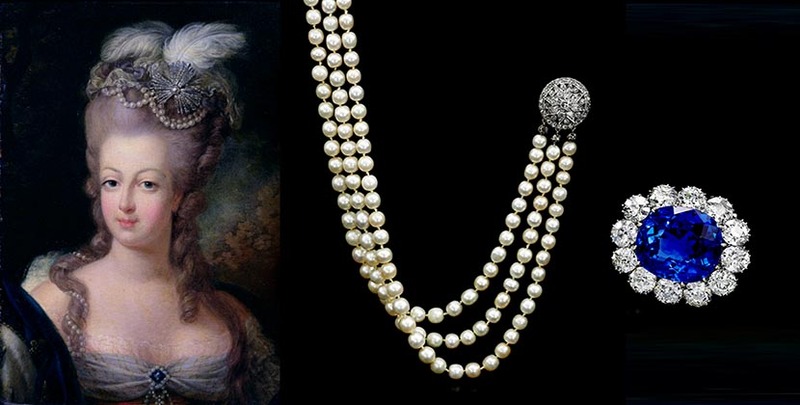 Marie Antoinette’s necklace features 331 natural pearls and a diamond clasp. 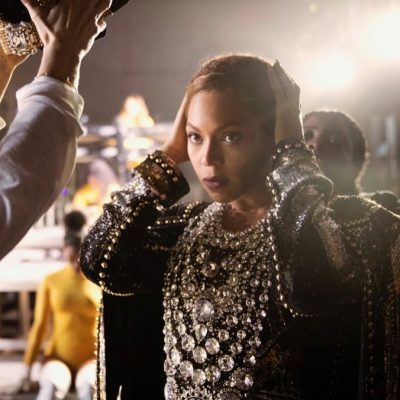 Sotheby’s estimate for the necklace is $200,000-$300,000. Marie Antoinette lived long before the days of cultured pearl farming. 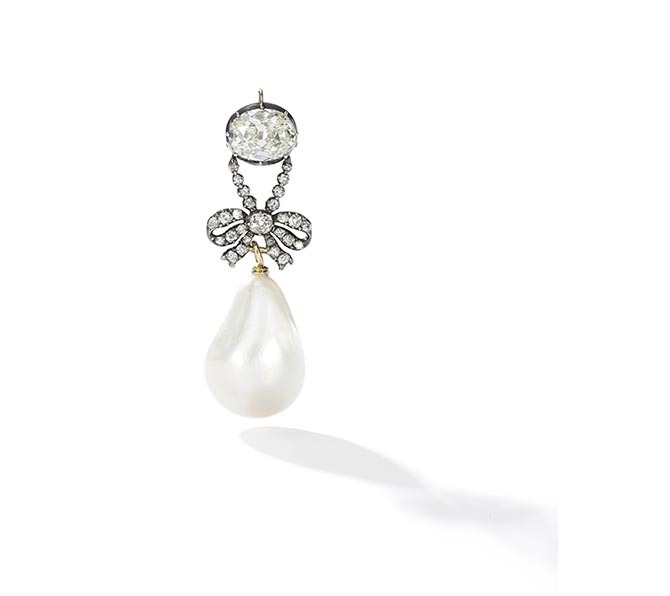 During her era in the late 18th century pearls were more valuable than diamonds, because they were so rare. The marine gem was part of her signature style. 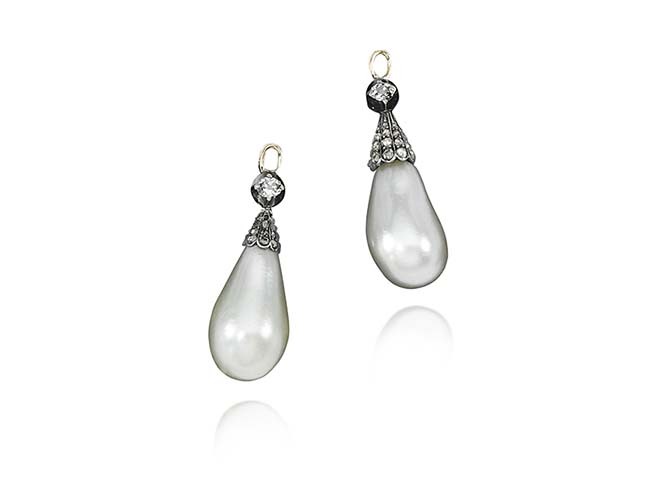 Marie Antoinette’s natural pear-shape pearl drops have diamond caps. Sotheby’s estimate for the jewels is $30,000-$50,000. 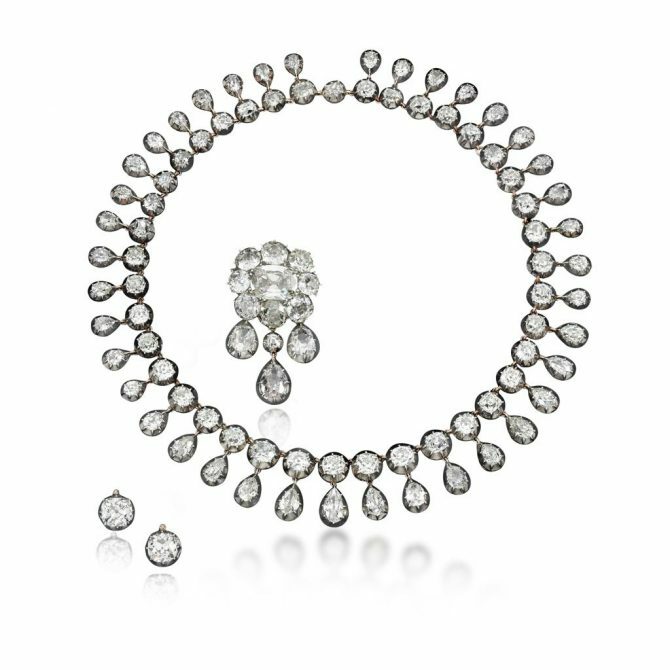 Some of the Royal Jewels from the Bourbon-Parma Family collection in the Sotheby’s sale have multiple royal provenances. A diamond parure made for Louise of France, granddaughter of Charles X, King of France and mother of Robert I, Duke of Parma, has 95 diamonds. Five of the gems belonged to Marie-Antoinette. A large number of stones adorned the sword of the Duke of Berry, son of Charles X and father of Louise. It also has a large pear-shaped diamond from the collection of the Archduchess Isabella of Austria, Princess of Croÿ. Sotheby’s estimate for the parure is $300,000-$500,000. The foliate scroll diamond tiara was a 1903 wedding gift from the Emperor Franz Joseph to his great-niece, Archduchess Maria Anna of Austria. 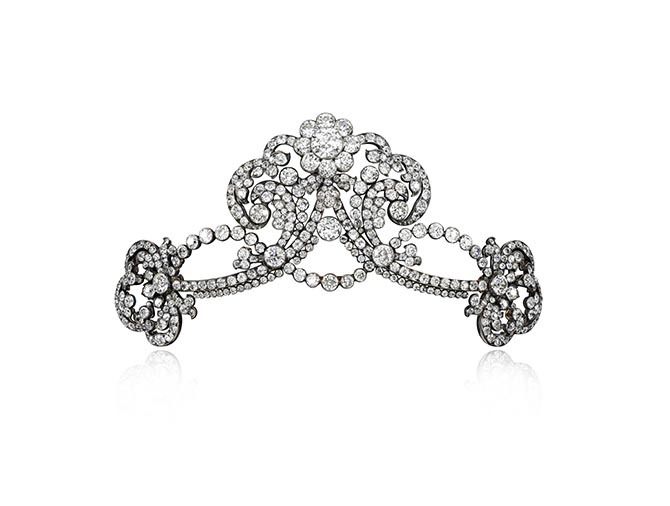 It was created by Kochert, a Viennese jeweler that catered to the Imperial House of Austria for generations. Sotheby’s estimate for the jewel is $80,000-$120,000. 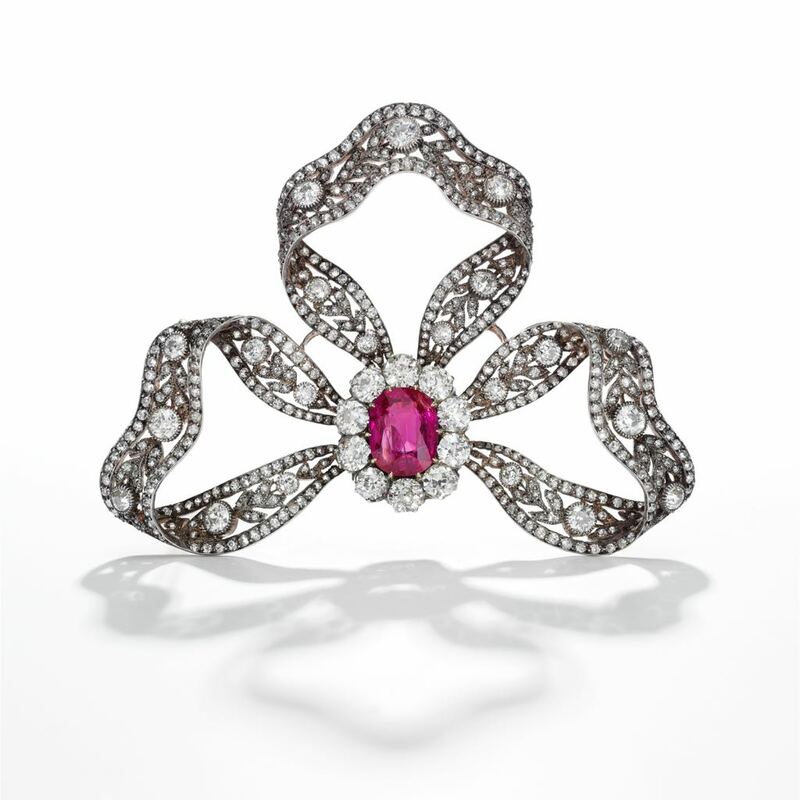 Archduchess Maria Anna of Austria received this diamond bow brooch set with a 6.89-carat Burmese ruby from her father Archduke Friedrich, Duke of Teschen to mark the birth of one of her sons. Sotheby’s estimate for the brooch is $200,000-$300,000. 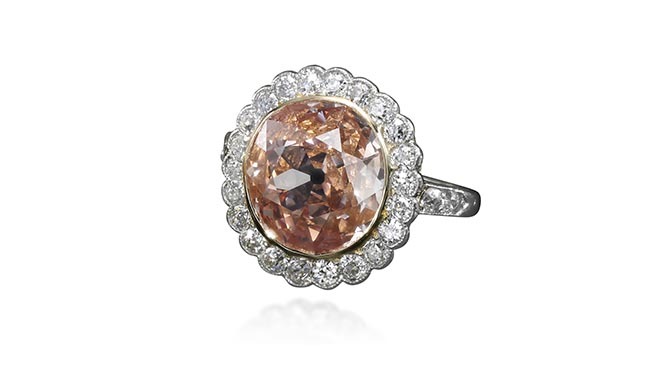 Another jewel the Archduchess Maria Anna of Austria received from her father when she gave birth to one of her children is this diamond ring set with a 2.44-carat orangey-pink diamond ring. Sotheby’s estimate for the ring is $120,000-$180,000. 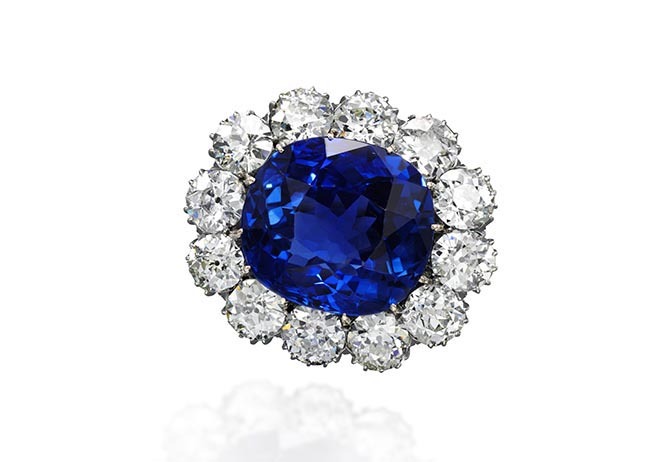 A 30.70-carat Ceylon sapphire is at the center of this diamond brooch the Archduchess Maria Anna of Austria received as a wedding present from her mother Archduchess Isabella of Austria, Princess of Croÿ. According to jewelry historian Vincent Meylan, the Archduchess had the brooch fashioned as a clasp for Marie Antoinette’s triple strand necklace seen above. 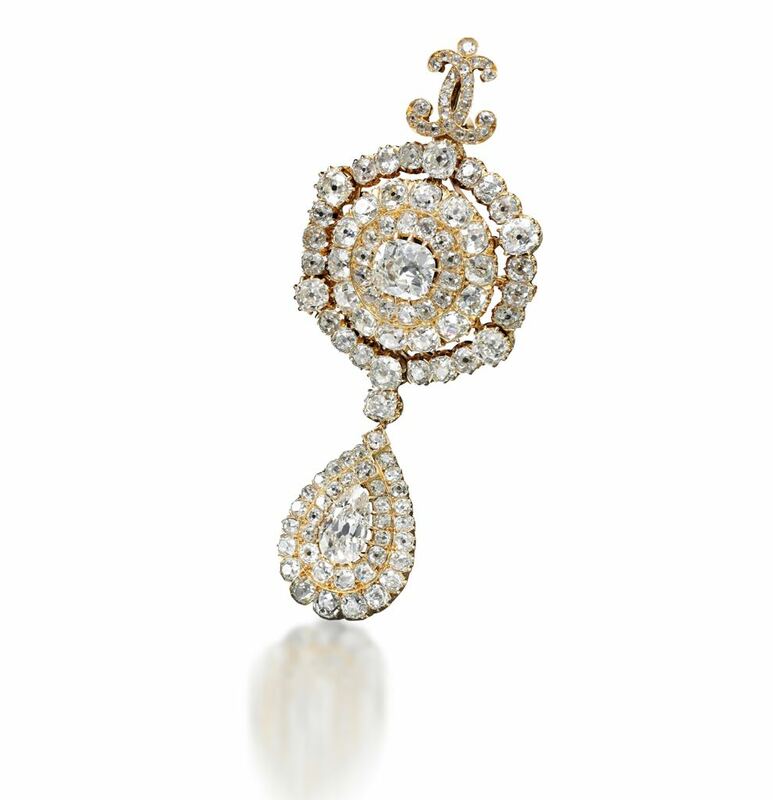 Sotheby’s estimate for the brooch is $150,000-$250,000. Most of the jewels in the collection being sold at Sotheby’s were given to Robert I (1848-1907), the last sovereign Duke of Parma and Piacenza, by his mother, Louise of France (1819-1864), grand-daughter of King Charles X of France and great-niece of Marie Antoinette. Robert I also received exceptional jewels from his paternal grandmother, Maria-Teresa of Savoy, Duchess of Parma (1803-1879), including these diamond girandole earrings. Sotheby’s estimate for the jewels are $150,000-250,000. For her 1869 wedding in Rome to Robert I, Princess Maria Pia of Bourbon of the Two Sicilies received from her husband’s grandfather, Charles II of Parma, a large diamond pendeloque brooch. Sotheby’s estimate for the jewel is $25,000-$35,000.